Having over 20 years of experience, one of our core areas of expertise is the ability to manufacture, assemble and undertake mechanical and functional testing of quadrupole mass filters for use in LC, GC, ICP, SIFT and QToF mass spectrometers. 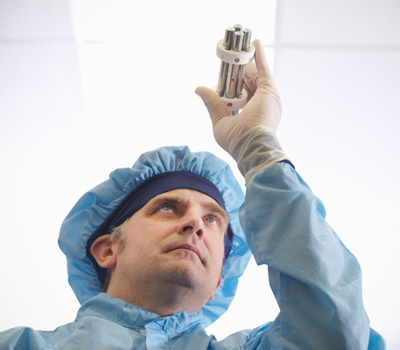 Through continued investment and development our capability has evolved into a state-of-the-art quadrupole manufacturing facility incorporating ion flight modelling, close tolerance rod and ceramic grinding, assembly in cleanroom conditions, a diverse range of fully automated component and assembly cleaning methods, as well as mechanical and functional testing. The Reliance standard quadrupole has proven to be a very cost effective solution for use in the proofing and prototyping stages of our customers’ designs and for use in lower volume instrument production. 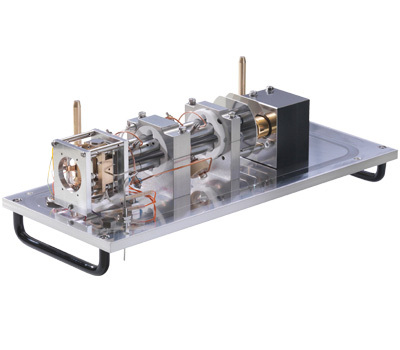 All of our quadrupoles are supplied cleaned, assembled in our laminar flow cleanroom, with mechanical test results, showing the maximum measured deviation between opposing rods. Our manufacturing processes are primarily based around electrode rods of 12mm diameter, up to 200mm in length, dimensions and features of which can be produced to precisions of 20 parts per million. We also have the capability to manufacture electrode rods in diameters from 6mm to 12mm. To complement this, the mechanical dimensions of the parts and assemblies can be determined down to hundredths of a micron, using Reliance’s unique test equipment. Electrode rods are manufactured from molybdenum. Our standard range of collars are manufactured in high purity grade alumina ceramic. Our standard quadrupole can be customised and, together with our ion flight modelling capability, offers our customers a high degree of flexibility in the design to suit specific technical and commercial needs. The standard quadrupole can be adapted to include additional options such as pre and post filters, mounting saddles and electrical connections. Electrode rods can also be manufactured from a variety of different materials including stainless steel. Our ability to optimise the design in terms of cost and performance can help reduce our customers’ time-to-market on new instrument designs, or indeed help to identify potential performance issues with existing instrument designs. 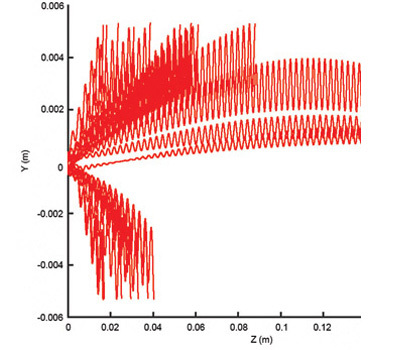 We have developed a computer model which simulates ion trajectories for quadrupole analysis. 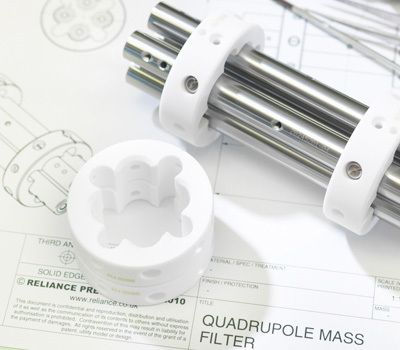 To enable us to undertake a more complete analysis of a specific quadrupole application we request that a Quad Enquiry Form is completed and returned to us. Please contact our sales team for more information on this service. The computer model is used to evaluate a design against its required performance criteria. Tolerance details for size, straightness, orthogonality, positional accuracy, curvature, taper, and parallelism can be studied, and tolerances specified in relation to the customer’s application. The modelling software is a key enabling tool, not only to aid customisation of the design, but also to assess the manufacturing and assembly issues involved in making the quadrupole. It allows us to determine the ideal manufacturing strategies and test methods to meet the performance requirements. The model can produce details of ion entrance conditions, trajectories, and exit conditions as well as representative mass peak shape calculations. Transmission versus resolution can be rapidly assessed for any design, enabling the optimum ion injection conditions to be specified. Using the customer’s parameters for their application, (e.g. mass range, resolution requirements, rf frequency, actual ion entrance conditions and energies), ions are injected in a round beam into the model, parallel to the Z-axis. Their trajectories through the quadrupole are then calculated by numerically solving a set of ordinary differential equations derived from the Mathieu equation. Only ion trajectories that pass through the circular aperture of the exit filter are regarded as having been detected. Several million ion flights are calculated in a simulation to determine the aggregate mass peak shape. The effects of imperfect quadrupole geometry can be simulated in order to identify potential resolution limitations and peak shape degradation. The ability to carry out mechanical and functional testing gives our customers a high degree of confidence in the quality of the assembly. It also contributes to high levels of first time pass rates of the parent machine. Every quadrupole assembly produced by Reliance is mechanically tested ensuring that it complies with the agreed specification. Mechanical testing is carried out on our internally developed and unique non-contact test equipment. A graphical trace is supplied with each unit showing the maximum deviation between opposing rods. We also have the capability, in collaboration with our customers, to carry out functional testing of the quadrupole. Functional testing can include all of or a selection of the following: verification of correct peak shape, scan of the mass range, review of sensitivity and resolution and contamination checks. 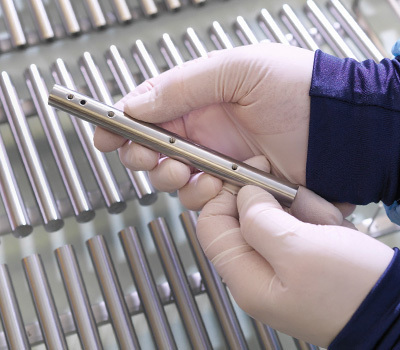 Reliance has a longstanding and successful track record in supplying higher level optic rail assemblies designed by our customers and which incorporate a quadrupole. We have effective and established processes in place to provide consistently high levels of quality and on time delivery performance. A well established supply chain secures specialist components such as electronics and vacuum pumps. Extensive cleaning processes ensure parts are cleaned to the high standards required to avoid contamination. Assembly is carried out in a suite of laminar flow cleanrooms capable of handling the most sensitive of scientific instrument work. Testing is core to everything we do and all assemblies are functionally tested and results recorded in line with our customers’ specifications.